Posted on Tuesday, May 8th, 2018 at 8:14 pm. We’ve confirmed the workshop timetable and details for BiFest Wales 2018. 12 noon until 6pm – daytime workshop, social, meeting and information space. 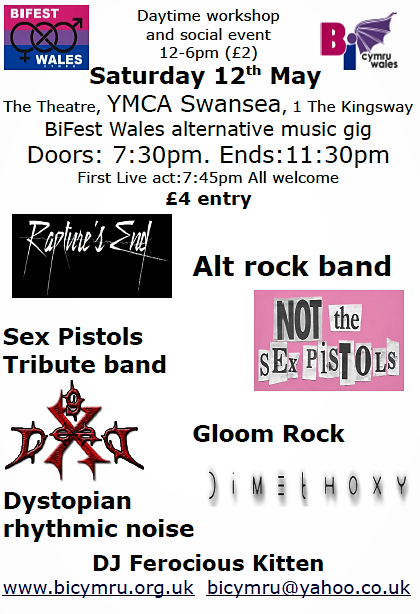 Under 16s FREE entry. Must be accompanied by an adult. Evening event – doors: 7:30pm, first live act 7:45pm, ends 11:45pm. 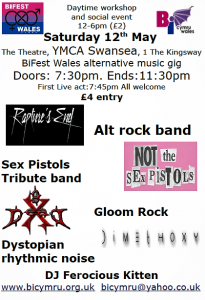 Entry: £4 (Under 16s free. Under 18s must be accompanied by a responsible adult) – more information on the evening event is here. Day and evening entry: £5 if paid together. BREAK for sound check – Only organisers and performers stay. 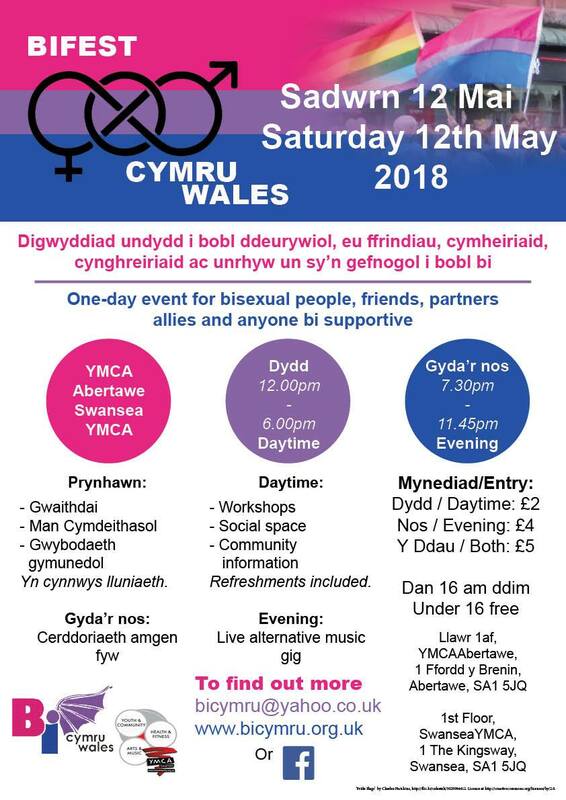 An introductory workshop at the start of BiFest Wales talking about different definitions of bisexuality, the bi community and events in Wales and the UK. Followed by a chance to ask those awkward questions you always wanted to, but didn’t feel comfortable to ask or didn’t know who to ask or anything you want to know or discuss. A version of classic speed dating, but intended to help people find friends with similar interests and people you may want to continue chatting with later on or in the social. Very informal and open to people of all ages. Ever wondered how the National Assembly for Wales and Welsh Government work? Ever wanted to know how you can get heard by Welsh and local government? This workshop will introduce you to how you can get involved and have your say at the Welsh and local levels. There’ll be an opportunity to ask your questions. Jointly run between Ele, Bi Cymru/Wales and Laura Price from the Assembly Commission. Roxy Williams, Trans Coordinator (Unity) and Foxy Roxy Reviews (Youtube) – a fun, interactive session with an introductory question and answer, followed by groups of participants having a go at answering trans* and bi themed agony aunt letters. At the end of the session you’ll have a chance to write your own letter to the trans* and bi agony aunt and have it answered by the group. Bisexual Issues in the Workplace – A workshop looking at experiences of being bisexual in the workplace and a discussion around our experiences and what can be done to make bisexuals feel included at work. Join South Wales AF for a fun filled badge making workshop! Whether you want to doodle your own or use one of our templates, make a pronoun badge or fly the bisexual pride flag high to celebrate it’s 20th year! We’ll have plenty of designs and ideas to help you and an array of craft supplies for those who’d rather make pictures, painting and prints! So come along and get artsy! All materials provided for by South Wales AF and Bi Cymru so no need to worry about bringing anything else! Suitable for all ages. Coming out is a very personal decision and not right for everyone. When people do want to come out there are issues around who to come out to? When? How? And how will people react? 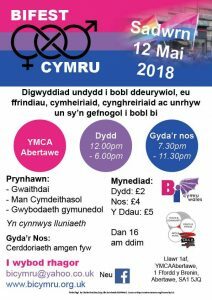 A discussion workshop around the topic of coming out as bisexual exploring experiences, good and bad, and general issues around coming out. A session playing fun, interactive and getting to know you games with other BiFest Wales attendees. This workshop will address issues such as would bi people report hate crime as homophobic? What stops bi people reporting hate crime? Are these issues different from the reasons lesbian and gay people don’t report? Would mentioning biphobic hate crime encourage people to report? You don’t have to have experienced hate crime to get involved in this workshop, but all participants will have a chance to express their views. 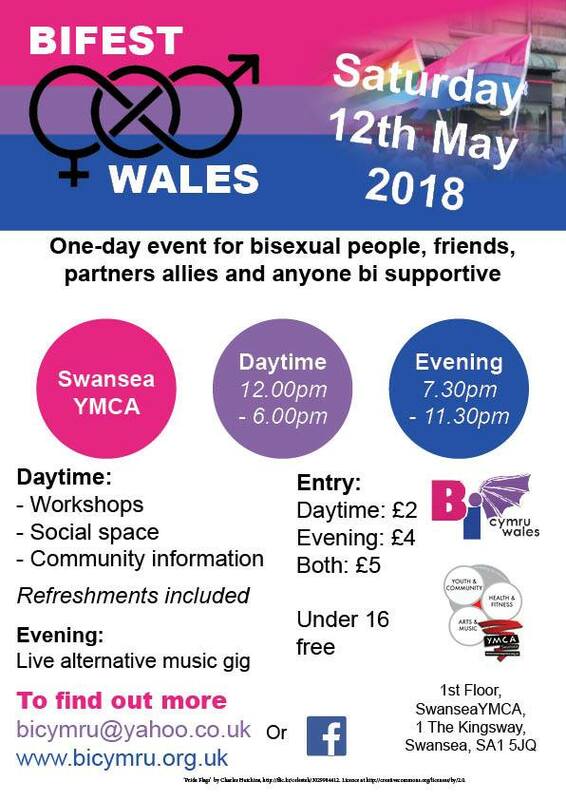 Bi Visibility Day 2018 – what will you do?